Other Camel Tours - Camel Dreams - Classic Camel - Camel By Night! This Camel trek is designed to start and finish in Rum Village (option 1). It can also be adjusted to start in Rum Village and finish in the Camp (option 2). Or start in the Camp and finish in Rum Village (option 2). 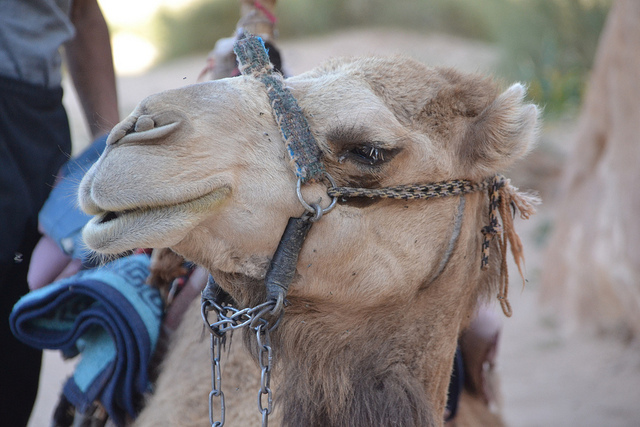 When you are ready you will head into the desert by Camel to enjoy your Camel trek. 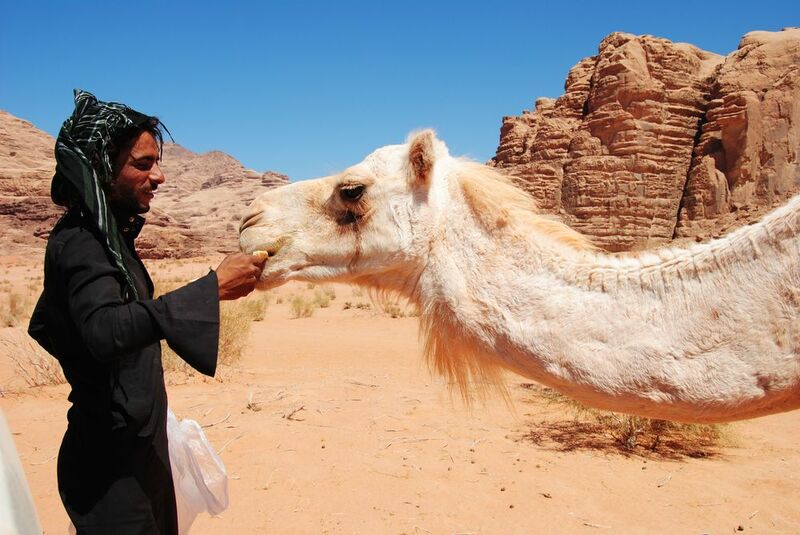 This trek visits the most beautiful valley in Wadi Rum (of course this is subjective). This is the valley described in Lawrence of Arabia's book. To Rum Village The trek ends in Rum Village at approx 4pm for your onward journey. 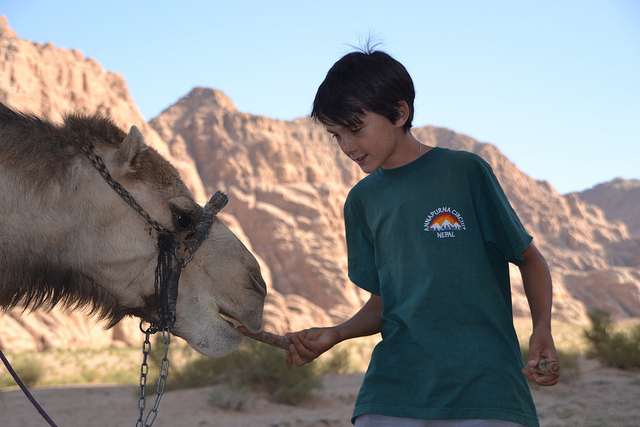 This trek visits some of the beautiful valley in Wadi Rum (of course this is subjective). This is the valley described in Lawrence of Arabia's book. El Qatar Spring This natural spring is set up in the mountain, and you can see what the Bedouin have done to catch the water. It is an interesting place. There is a Bedouin Graveyard and a lovely view across the valley where you have been trekking. 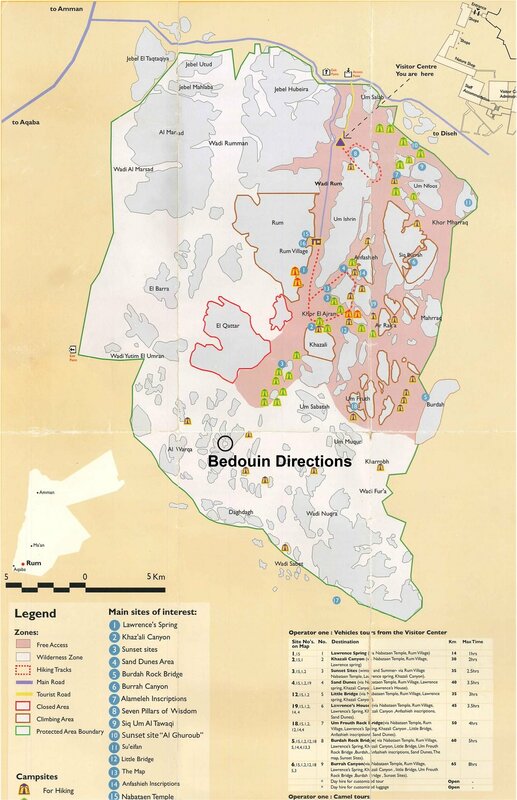 To the Camp: Enjoy a delicious Bedouin dinner, the stars and the night in the desert. At the Camp we have Bedouin tents (private), with mattresses and blankets. We have toilets (two Western) and two showers (cold water/sun warmed). We have a cosy main tent with a fire for sitting and relaxing in. The Camp is in the white desert in a unique and beautiful location, secluded and away from any other tourist camps. In the morning we have breakfast in the Camp at approx 7.30am. We will be arriving in Rum Village at approx 8.30am for your onward journey. The 5JD p.p entrance fee is NOT included. Drinks & Lunch on the tour are NOT included. A mounted guide IS included. Young children of 5 years and under, can share a Camel with a parent. In this case there is no extra cost for the Camel. Children that ride their own Camel are charged as above counting as one persons. This tour can start in the morning or afternoon. If you arrive between 9-10am the trek will finish back in Rum Village by approx 1-2pm. It can also be started at any time after 10am and the tour would finish 4 hours later. You need a minimum of 4 hours daylight to take the tour. Sunset would not be included in this program. The 5JD p.p entrance fee is NOT included. Drinks & Lunch on the tour are NOT included. A mounted guide IS included. One night in the Camp, dinner & breakfast ARE included. This tour would usually start in the afternoon. If you time it right sunset can be included. Please contact us directly for more information about including sunset. This trek can also start from the camp and finish in Rum Village. You would usually start at 8am and finish at approx 12pm.